Panasonic Lumix TZ90 review: The ultimate travel camera? If you're looking for the best all-round near-pocketable travel zoom camera then the TZ90 is the one. Some low-light and full extension issues can cost it, but that's to be expected considering the overall feature set. 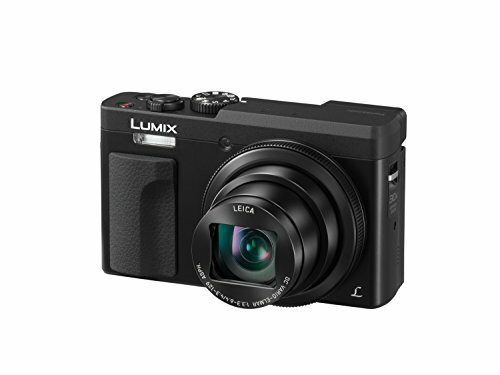 The Panasonic TZ-line is a long-standing pocket-friendly camera series, which has gone from strength to strength over the years. Each annual iteration adds a new feature, with a tilt-angle screen being the TZ90's main boast; that means waist-level or even front-facing selfie shooting from this palm-sized snapper. Last year's TZ80 didn't have the tilt-angle screen but, otherwise, is a similar camera overall for a little less cash. Key to the TZ90's specification is its long-standing 30x optical zoom, delivering a 24-720mm equivalent focal length, for snapping wide-angle shots of your mates or those far-away subjects as if they're close-up in the frame. If you're contemplating a holiday camera then this Panasonic might take top marks on that fact alone - but with 4K video and photo features adding to its pomp, there's plenty of reasons to recommend this camera. Squeezing a tilt-angle screen into the TZ90's design means it's a couple of millimetres taller and deeper than its predecessor to accommodate. But the difference is slight and this is still a palm-size camera. Perhaps not pocketable for those who wear skinny drainpipe jeans, but hey, you'll still get it into a little bag. The TZ90 leaves no stone unturned when it comes to spec for a camera of this type: complementing that tilt-angle LCD screen is a built-in viewfinder. It certainly has its uses - when it's ultra-bright outside it'll help to see composition more accurately - but, the more we think about it, the less we've found it practical. Its small scale make it feel somewhat secondary to the TZ's make-up. The TZ90 otherwise bridges the gap between point-and-shoot simplicity and more advanced controls very well. It's not overcomplicated: pop the mode dial into iA (intelligent Auto) and everything bar zoom adjustment is done for you. If you want to step things up then full manual controls are available to take command of aperture and shutter speed, while the rear rotational d-pad can also be used to quickly dive into exposure compensation, close-up focus and burst mode. Delving into the main menu won't be something you'll need to do too often (save for turning off that darn annoying beep and fake shutter sound): the Q.Menu brings up all the major on-screen controls, which can be adjusted by a tap of the screen or by using the rear d-pad. Easy peasy. Although it's a bit odd that the Q.Menu is represented by the waste basket symbol, as the inclusion of 4K Photo and Post Focus modes has relegated it to this double-use position. In use we've found the TZ90 to be generally decent, with only a few hiccups to hold it back. Thing is, compared to its nearest (and pretty much only) rival, the Canon PowerShot SX730, the Panasonic is leaps and bounds ahead when it comes to the level of adjustable detail available. Take the Panasonic's autofocus, for starters. The 49-point system is quick, but critically it offers a heap of modes, comprising face-detection, tracking, 49-area, custom multi, 1-area, and Pinpoint. You might not find all of those modes useful all of the time, but once you've latched onto the one or two that make best sense for you, the TZ90 really sells itself. By compare to the Canon offers two simple modes which, quite simply, aren't as comprehensive for getting the shots you're likely to want. Our favourite TZ90 focus mode is Pinpoint. It depicts a cross-hair on screen, which when half-depressing the shutter button will zoom into 100 per cent scale to assure precision focus, before you take the shot. It's our go-to mode for any still subjects; otherwise tracking does an ok (but not amazing) job of following moving subjects. Close-up focus needs to be manually engaged (when in a manual shooting mode) by hitting the left d-pad direction and toggling between standard AF and AF Macro, the latter allowing for 0.03cm close-up focus at the 24mm equivalent. That drops to 2-metres when extended to the 720mm equivalent, though. If the camera is in an Auto mode it will automate between these standard/macro options for you. We've found the TZ90's touchscreen to be really responsive, too, while the tilt-angle screen is easy to pull away from the body and manipulate through its 180-degrees to any angle, including facing forward for selfies. How you feel about this will depend how you feel about selfies: we don't care for it and would prefer a screen which pulled away from the body to also angle downwards for over-head shooting, but can't have it all we s'pose. Then there's that lens. It's both brilliant and limited in the same breath. All of this comes down to expectation, really, but the degree to which the zoom is extended affects the autofocus performance quite significantly due to the amount of light entering the camera at the longer focal lengths. That's one of the issues with a lens of this reach in a body this small: it can't have an ultra-wide aperture, which means low-light performance isn't very good (you'll see frame-rate slowdown on the screen) and capturing sharp images is trickier. It's also a bit slow to extend through the zoom range and we feel a 20x zoom would deliver the necessary degree in a camera such as this (wind back a few TZ models and that's what it used to be). At the same time, however, the lens is brilliant - it defines this camera. The ability to zoom-in seemingly forever is very handy when shooting far-away subjects. We snapped a dog in Central Park and were achieving shots that simply wouldn't be even nearly possible from a phone. Ok, so the results aren't as pin-sharp as from, say, a dedicated DSLR - but the TZ90 is a small-scale camera and its lens is well balanced considering the wider market. You've probably noticed that 4K is on the rise. Tellies are pushing it as the must-have resolution. Broadcasters are beginning to push it, with the likes of Netflix and Amazon Prime Video, in particular, shooting their original shows at the ultra-high definition resolution. So for Panasonic it's an obvious choice: almost all of its most recent cameras feature 4K video and the curiously-named 4K Photo option too. At first we weren't sure about 4K Photo. We didn't get its naming logic. But it's a potentially very useful mode that, essentially, captures a burst of 4K footage at 30 frames-per-second so you can extract an 8-megapixel still direct from the camera - no need to muck about with off-camera software. We were shooting some sparrows fighting over a churros (birds these days, eh?) and found it really handy to activate, hit the shutter, and then have a choice of 30 shots to choose from - only around three of which were usable or well composed. But that's the very point: the mode allows you to pick out the decent shots that you wouldn't otherwise have captured and throw away the naff ones. However, the way it's presented isn't very consumer friendly. Hit the dedicated 4K Photo button and the options for "off/4K Pre-Burst/4K Burst(S/S)/4K Burst" are available, which many camera newbies will be sat trying to decipher - or might just switch off completely and never use the mode. They're worth learning though: 4K Pre-Burst captures a second of footage before you've even pressed the shutter, to avoid missing the magic moment; S/S stands for start and stop, so you'll need to hit the shutter to commence and again to cease capture; 4K Burst, the default, is a press-and-hold option which we think makes most sense of all. Still, Panasonic should be able to convey this information in a more visual manner directly from the camera. Next up is Post Focus mode - which does what it says on the tin, allowing you to focus the shot after taking it - which has a prominent position on the camera's Fn2 button. If you're hoping to shoot hand-held like you would with a Lytro camera using this mode, however, then you'll be disappointed: the Panasonic needs a tripod for steadying the frame while it grabs a movie file at multiple focal depths. It's possible to play back the 49 collective Post Focus files per shot - each focused slightly apart, from front to back - which highlight in red or green to verify an in- or out-of-focus subject respectively. There's some application to this mode, but it's more fun than a must-have. And if you're mounting on a tripod to shoot then you ought to be adept enough to critically focus in the first place. If you're most interested in 4K movie capture, for UHD home videos, then the dedicated button atop the camera can fire this off. The maximum 3840 x 2160 resolution is available at 30/25fps (100Mbps MP4 files), which makes for good quality. If you only want Full HD then the 1920 x 1080 option is available at 60/50fps (28Mbps maximum), so there's no ultra-high frame-rates for slow-motion options outside of 720p, which is a shame. With all those features on board, there's scope to take some great pictures. The TZ90 certainly favours good lighting conditions to a considerable degree, however, given the limitations when the lens is put through its zoom paces. The entry-level ISO 80 sensitivity is used when there's heaps of light, which delivers the crispest, most colourful results of all. We've captured the American flag hanging in the wind on New York's Lexington Avenue, its stars and stripes standing out in vibrant blue and red. Detail is at its best the lower the ISO sensitivity. With such a pixel-packed sensor on board the TZ90 can quickly be knocked aback by a rise in sensitivity - which is something it'll often have to do when zooming in more with the lens, given its aperture limitations. We shot a sparrow gathering for a nest at ISO 400 and while we're pleased with the shot - it's way beyond what we'd get from a mobile phone, that's for sure - look at the image at 100 per cent scale and the result of image processing can be seen, with precision detail not as high as a larger-sensor camera. There's also some slight colour noise in the mid-grey shadow areas of the bird. But that's only prevalent if you need to use the shot for every pixel its worth - and it's rare that a 20-megapixel image will be displayed as such, as that's the same as more than nine Full HD flat-panel TVs sat side-by-side. As that ISO sensitivity rises, so we find the TZ90's weakness. With a cap of ISO 3200 by default, it can be difficult to have the necessary light and settings available to shoot in dim conditions. We were trying to capture in a dim-lit burger bar, but the shutter speed was forced so low that we struggled to get anything usable. When ISO 3200 did come in handy as a last resort, it's also not the cleanest or sharpest looking. That said, the processing does a good job of wiping clean any colour noise so the shots are usable. Ultimately, then, the TZ90 is very capable in good light but not as stand-out when the light dips - partly as a product of its far-reaching lens. The Canon may arguably offer more on the quality front, but it's the lesser camera when it comes to performance and features so, all weighed up, we think the TZ90 is as good as a camera of this type currently gets. However, weigh up your expectations, because that 30x optical zoom lens - as useful and often great as it is - runs into limitations at longer zoom lengths and, in particular, low-light conditions. Used in good light and medium-long zoom, however, and you'll get shots with the TZ90 that will see all your phone-camera mates asking what kit you have. As we said of the TZ80 from last year, the camera world is in the throes of change, with often 1-inch sensor models now ruling the roost. The TZ90 shuns that larger-sensor proposition for the sake of zoom and size - and while that won't always mean the very best image quality across the board, it does amount to the best all-round zoom-packing pocket camera. Don't need that tilt-angle screen, the extra resolution and want to save a little cash? The older-generation TZ80 has you covered. It's got the same 30x optical zoom lens and 4K Photo modes, which means it's mighty similar to the newer TZ90.